Loss limits is known to be another strategy that is widely applied in the 5 coin slot machine gambling. Alongside the other strategy like naked pull it is used to help the gamers save their money and time. 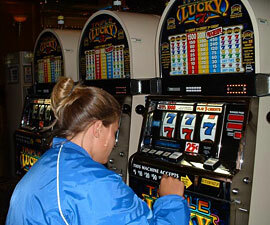 As the 5 coin slot strategy loss limits is aimed to decrease the losses during slots gambling. Loss limits are known to be the amount of cash that can be probably lost by the gamer on some particular gambling day. If the gamer lost a lot, the main thing is to quit and that is that! It must not be going back to take more money for gambling at the cashier. The strategy demands leaving and forgetting about the playing slots at least until the next day. In fact, every player is sure to lose something. However, it is important to keep an eye on any kind of expenditures, especially on losses. It is really wise to decrease the losses to the minimum in order not to be ruined and frustrated because of the lack of luck at slot machines on a particular day. In fact, the higher losses, the more the gamer can feel miserable. Thus, the main aim of the loss limits is to protect the gamer's bankroll from the exhaust. For example, solid sum of 60 % of the whole session amount of money at some particular slots is known to be nice loss limit. It is possible to set even lower; it rather depends on the gamer. 30 or -50 percent will also do. However, it is advisable not to lose more than 60 per cent. For instance, twenty dollars may be completely lost. By setting the loss limit 60 percent of twenty dollars is 12 bucks. Thus, once the gamer lost 12 dollars, that is considered to be the limit, no more bets! It is advisable to take another eight dollars and leave! In addition, there is one more tip of loss limits strategy. It is wiser not to play to the very last coin! Some players truly believe that even if the slot machine does not repay after spending 14, 16, 18 dollars, if they pay the last coin then slots will probably repay and cover all losses. It is essential to be realistic in such cases! It is more likely to be the cold machine and it will not repay.